When Milton L. Simmons, 1949 ceramic engineering graduate, died in 2005, his daughter knew she wanted to do something special to honor his memory. Gamble was an administrative assistant in the development office in early 2013 when the University of Missouri System announced the 20/20 Challenge. Through the 20/20 Challenge, the UM System would give Missouri S&T $400,000 in state funds to create 20 need-based scholarships, but S&T had to raise matching funds in private donations. Gamble accepted that challenge and donated $30,000 to establish the Milton L. Simmons Endowed Scholarship in Ceramic Engineering. The state matched $20,000, bringing the total endowment to $50,000. Like all of the scholarships established through the 20/20 Challenge, Gamble’s scholarship will be awarded to a student who qualifies for the federal Pell Grant program, which provides tuition assistance to undergraduates from economically disadvantaged families. The Milton L. Simmons scholarship will go to a Missouri S&T student in ceramic engineering. “My father worked at Ferro Corp. in Cleveland, Ohio, his entire career,” Gamble says. “He started as a ceramic engineer, traveling to places like Japan and South America with my mother. After a few years, Ferro sent him to law school and he became the company’s patent attorney. 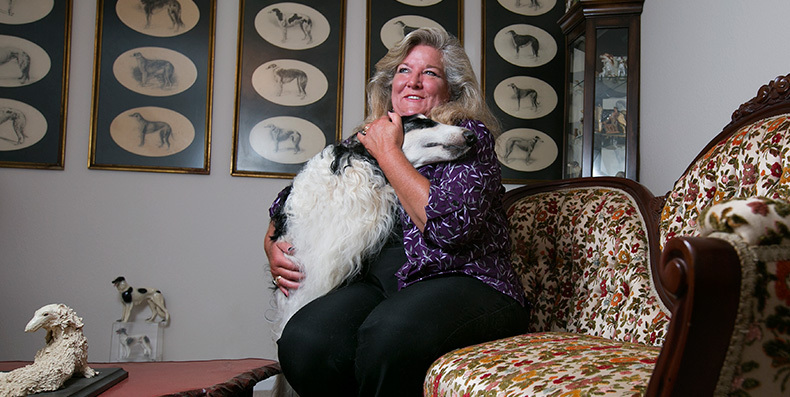 Gamble raises Borzoi, dogs that used to be known as Russian Wolfhounds, on a farm outside Rolla. She shows her own dogs and is approved by the American Kennel Club to judge four breeds in Conformation Dog Shows, as well as all breeds in Lure Coursing. For more information about giving opportunities, visit giving.mst.edu.